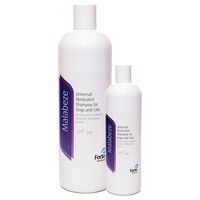 Malabeze Universal Medicated Shampoo is a deep cleansing and deodorising shampoo which can be used to help alleviate most of the common dermatological (skin) conditions found in dogs and cats. Containing soothing and moisturising qualities which allows frequent washing if necessary, the pleasant-smelling shampoo has a neutral pH and is non-irritating on the skin. Malabeze Shampoo has all the advantages of a medicated shampoo without the need for a prescription and offers a fast contact time.